Importing, distributing & manufacturing of Glass Balustrading and fencing products that are suitable for Balconies, Decks, Stairways, Pool fencing & internal balustrading applications. 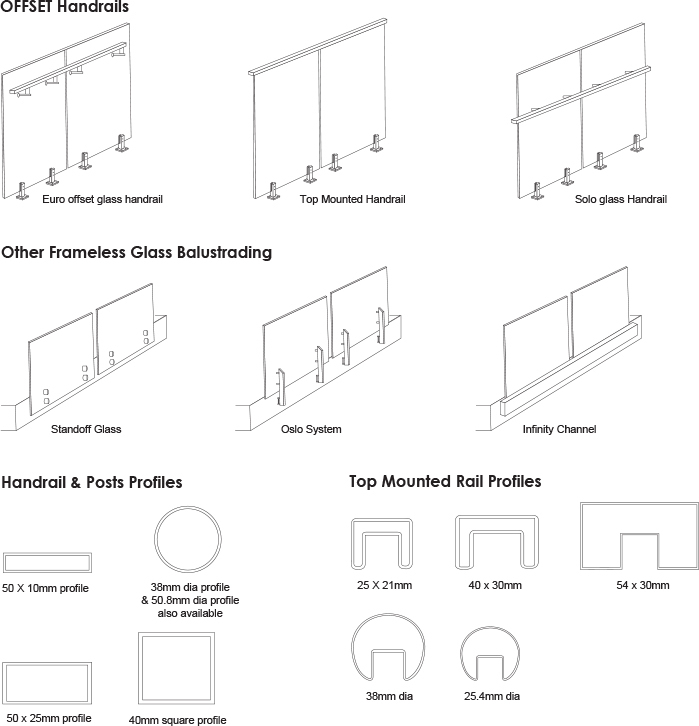 Uses 50mm Powder coated Aluminium Glazing Posts and an optional elliptical or rectangular handrail, this system is the most cost effective. Aluminium Posts can be colour co-ordinated to suit your project. Also available using stainless steel glass clamps and the system can be used with posts of any material. This system uses 970mm high glass panels and can have a handrail incorporated into the design if required. Handrails can be top mounted or offset mounted. 1200mm High Pool Fencing Panels satisfy all safety requirements in all states of Australia. All fittings are 316G Stainless Steel and suitable for poolside use. View glass balustrading completed projects.